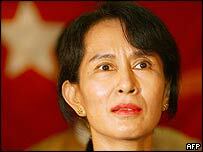 Burma's opposition leader Aung San Suu Kyi has had her house arrest extended, her party said on Monday. Aung San Suu Kyi has been held since May 2003, after clashes between her supporters and pro-government forces in northern Burma. The reported extension comes after Burma's ruling junta pledged to release 9,000 prisoners and appointed a new Prime Minister, Soe Win. It was not clear how long Aung San Suu Kyi's detention had been extended for. U Lwin, spokesman for Aung San Suu Kyi's National League for Democracy (NLD), said police had visited her at her home in Rangoon to tell her that her detention had been extended. U Lwin said the NLD believed this meant she could now be under house arrest until September, 2005. The Nobel Laureate has been detained in her lakeside villa since September 2003. She was first detained in May that year, spending some months in Insein jail, then receiving medical treatment for a gynaecological condition, before being confined to her home. The reported extension follows the appointment of a new Burmese Prime Minister, Soe Win, who is thought to oppose engaging with the NLD. He is also thought by some government critics and diplomats to have been responsible for orchestrating the clashes which led to Aung San Suu Kyi's detention last May. Aung San Suu Kyi has been under house arrest twice before - the first time for six years between 1989 and 1995, and the second time for 20 months until she was freed in May 2002. She has repeatedly said she would be willing to be the last person to be released in order to see all of the other estimated 1,300 political detainees freed. Her party won a landslide victory in 1990 but has never been allowed to govern by the military, which has run the nation since 1962.